Little Common Football Club avoided a potential banana skin to claim a big victory in its title quest last night (Tuesday). 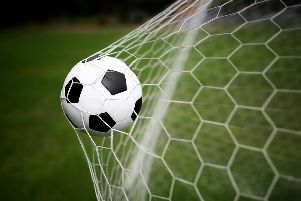 The Macron Store Southern Combination League Division One leaders struck three times in the final half-hour to turn a 1-0 deficit into a 3-1 win away to Hailsham Town. Lewis Hole, scorer of Common's match-clinching third goal, on the ball. Adam Smith, Lewis Parsons and Lewis Hole were the scorers as Common ground out a result in difficult wet and muddy conditions at The Beaconsfield. Common were below par during a first half which started in the dry before heavy drizzle soon began to fall. Too many passes weren’t finding their intended targets and Common couldn’t stamp any authority on the contest as a result. Their best moments of the opening period saw Hole fire just wide of the near post after chesting down Louis Walker’s cross and later volley wide after Wes Tate flicked on another Walker centre. Right at the end of the half, Tate blasted a free kick from just outside the box well over the top. Hailsham led at the break thanks to a set-piece goal in the 26th minute. Former Common player Casey Ham delivered a free kick from near the byeline on the right and Ashley Jarvis headed home at the near post, despite Common goalkeeper Matt Cruttwell getting a hand to the ball. Common defender James Maynard keeps a close eye on Hailsham forward Peter Cooper. The Stringers had a decent chance to double their advantage seven minutes later. A fortunate ricochet put Peter Cooper through on goal, but the forward shot wide with only Cruttwell to beat. The rain came down harder in the second half, causing the pitch to become very heavy and slippery. Sam Divall shot tamely into the arms of Cruttwell from Harry Butler’s cutback when invitingly placed inside the box, while at the other end, Jamie Crone was denied by an important Liam McCann tackle after stand-in Hailsham goalkeeper Jamie Salvidge slid out and missed the ball. Common weren’t really making much headway until equalising somewhat fortuitously in the 66th minute. Smith’s shot from outside the area took a wicked deflection which left Salvidge with no chance. Lewis Parsons celebrates after scoring Common's second goal, against the club he played for last season. That goal was the key moment in the contest as the Commoners looked a different side thereafter. Crone blazed over from an inviting position having been played in by Sam Ellis and you sensed the momentum was shifting Common’s way when they hit the front in the 71st minute. Tate’s corner from the left was powerfully headed home from close range by former Hailsham defender Parsons, who teased the home supporters by holding his hand to his ear as he ran past the stands in celebration. Common showed good game management during the remainder of the match, keeping the ball in Hailsham territory for the most part and never looking like surrendering their advantage. Harry Saville wasn’t far away from the far corner with a floated effort from an acute angle before a well-delivered Paul Feakins free kick was neatly glanced into the far corner by the head of Hole only for the offside flag to be raised. Common secured the points with a beautifully-worked third goal in the 89th minute. Ellis rolled the ball in to the feet of Tate, who produced a sublime flick for Hole to stroke past Salvidge. It was the sort of night that tests the credentials of potential title winners and in the end Common passed the test well as they scored three goals in beating Hailsham for the second time this season. Common: Cruttwell, Feakins, Walker (Saville 65), Ward (Bachellier 56), Maynard, Parsons, Tate, Smith, Hole, Crone (Collier 90+1), Ellis. Southern Combination League Division One top half (played-points): 1 LITTLE COMMON 25-64 (+58 goal difference), 2 Langney Wanderers 24-57 (+42), 3 Lingfield 23-49 (+40), 4 Wick 23-44 (+28), 5 Mile Oak 24-44 (+11), 6 BEXHILL UNITED 24-43 (+24), 7 Ringmer 25-42 (+16), 8 Selsey 22-37 (+11), 9 Steyning Town 23-31 (+15).